After posting my Mall of America Meet & Greet video and blog recap yesterday, I had some questions about the makeup, hair, and outfit. So I figured, why not answer those in a blog post! :) First off, (as if you didn't know) I love all-out glamour. The lashes, the curls, the dress... all things feminine were going in full force on this day. I unapologetically LOVE glam. Some days I go subtle, but this was not one of them. Outfit: This dress was something mom and I ran across a few weeks ago while shopping at TJ Maxx. It was just $20! I actually had a different outfit in mind, but once I tried this on, we both knew that this was the dress. I love the bright coral color, the fabric had a comfortable amount of stretch in it, and it just worked with my short, curvy body. I actually found my shoes at TJ Maxx as well... you can barely see them in this picture but they're a black wedge from Aeorosoles. They felt SO comfortable! Key word: felt. The comfort didn't last much longer than an hour after standing at the event. I was content with just kicking them off and going barefoot (I did for awhile) but Simone from Sigma rounded up some flip flops! :) Also, wearing a color this bright, I did a couple rounds of self-tanning during the week leading up to the event using my trusty St. Tropez Bronzing Mousse and mitt. Oh yeah, I'm also wearing my Sally Hansen Airbrush Legs lotion in tan. Hair: I knew I wanted to go with some sort of side-swept style for this event because I just feel like even if the curl doesn't hold in my fine hair, it'll look less stringy and blah if it's all off to one side. Kind of a preventative measure- LOL! 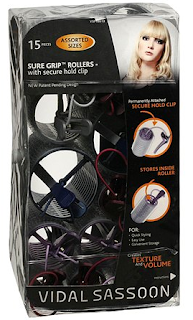 I used my Vidal Sassoon velcro roller set- the kind that has the little clips attached to the rollers themselves so you don't have to worry about losing them. I always travel with this set! You can see the basic technique in my updated Velcro Roller video, but in a nutshell, I wrap a small section of hair around a small-ish curling iron and then wrap it around the roller. I use larger rollers around the top, and smaller rollers on the bottom (this works well with my layers). Unlike the video, I put in rollers all over my head for what I hoped would be the best chance for long-lasting curls. I kept the rollers in for an hour or so while I did makeup (alongside Kristin Gehm!)... the longer you can leave them in, the better! Then I took them out, brushed out my hair, swept it to one side, and criss-crossed a couple of bobbi pins in the back to keep it there. I sprayed the whole look with Tresemme Tres Two (of course). Looking back, I wouldn't have bothered with the pins... when hugs were happening, they shifted around, hair came out of the pins, and I should've just pulled the hair to one side and let it be. Or done a ponytail. But from the front, everything looked fine and the curls actually lasted throughout the event! YAY for attached hotels and malls... eliminating that pesky outdoor humidity! hehe :) Earrings are just my big studs from Claire's. MAC Pro Longwear Foundation NC35 (needed this shade which is a bit darker than my EL Double Wear since I'd been self-tanning). I'm a bit of a doofus and forgot to take a classic "looking down" eye makeup shot so you could get a clear look at the eyeshadow. So I went back to look at my vlog to see if there were any moments where you could see it. These screenshots aren't clear, but hopefully you can get a bit of an idea of what I did! Also, I cried several times (overwhelmed, happy tears) during the event, and this look didn't smudge. I wasn't required to wear a Sigma product for this event, but I'm all about oranges lately, my dress was orange, and this Dare palette rocks. I've been using it a LOT lately. And FYI: there is a special 20% off discount code from Sigma, valid July 22-29 only. The code is- SBAP20. 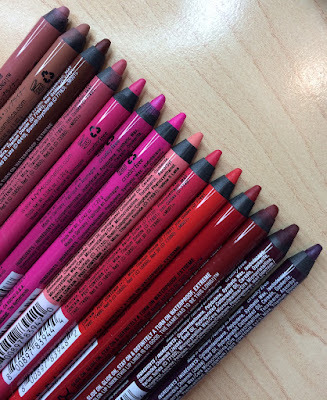 I used the following shades swatched here: Chase, Grasp, Surrender, Catch, and Escape. After eyeshadow primer, I patted Chase (shimmery light peach) on the inner part of the lid & around the tear duct. I overlapped a bit of that with Grasp (shimmery coral), and covered the rest of the lid. I used Surrender (deep plum) in the outer corner, creating an outer V. I also smudged this shade under the eye. I blended Catch (matte orange) throughout the crease, sheering it out as I got closer to the brow. I used a bit of Escape (creamy shimmer) as a highlight under the brow. MAC Lipglass in Pink Lemonade - love this gloss and it really lasted a long time without feeling annoying! A helicopter is flying overhead! Cupcake invaded Tyler's underwear drawer this morning. Full coverage of that, plus some cheesy puns on my Instagram. Over the weekend Tyler & I were at our favorite area pub when I was apparently gesturing a bit too enthusiastically & pretty much back-handed his glass and it broke! (it was empty, thank goodness). I was so embarrassed! Everyone who saw was really nice about it, and nobody let out a big "OOOHHHHHHHH!!!!" 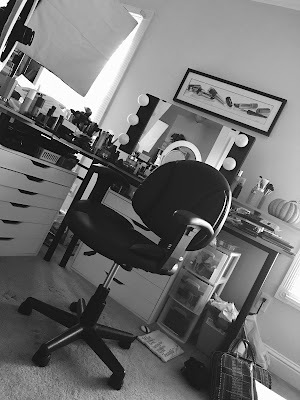 (pet peeve discussed recently on Beauty Broadcast Live- lol). The bartender said- "not the first time, and certainly won't be the last!" He got a great tip. I love this look! 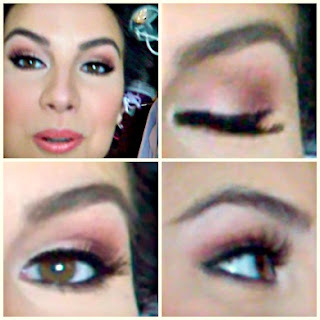 I absolutely love the Red Cherry #43 lashes..they are gorgeous! You looked stunning! Really love your makeup but you always look great no matter what. Too bad I couldn't go. Em you rock. the dress looked great on you . You should think of going to diff cities all over the nation and do a meet and greet, maybe individual level consultaion with the public and a little session ( paid by each participant ). That way you make some money too and why not? u have a talent so use it girl . Too bad some people don't like that you are a sigma affiliate and said rubbish some time back. I seriously couldn't be happier for you! You deserve all the amazing things that are coming your way. Really wish I lived closer so I could have met you! Canada is just a bit too far away ;) I'm loving everything about this makeup look. Very interested in the Sigma Palette and that Tarte lipsurgence! Wow, you look AMAZING! This is so exciting and I am so happy for all of the incredible things that have been going on for you. Love this look Emily! I completely adore your dress :) Wish there was a better shot of your eye makeup, just so I can be amazed its awesomeness! Love, love, love the coral dress! You look so glammed up and put together. Love the whole look but the makeup takes it up a notch. It's fabulous! You always look great but I did think this look was stunning and so glam. It was the perfect look for the event. The dress was the perfect fit, the hair was amazing and of course the makeup was no exception. Thank-you for making this post, I have been playing around with my shadows to recreate this look! Em, how I wish I were there to join you! Hopefully one day I go to visit and we are bffs for one day???? :D hahaha! LotS of love lady!! Your make up looks tremendous, as always, but your eyes look look super amazing! !! LOVE IT! GREAT JOB WITH THE MAKE-UP. Love your costume also. Cute blog! You looked gorgeous Emily! I wish I could've been there to help support you. You're amazing! Wow, your entire look is stunning! I love your makeup it looks so natural and appropriate for your event :) I'm also a fan of Sally Hansen's Airbrush Legs lotion, it's perfect for giving legs a gorgeous glow. Your dress is absolutely fantastic!! I love it! You look stunning! That dress is gorgeous! Great post and you looking so hot, i love your dress, thanks for sharing with us. Loved the entire look! Totally wish I there!